Cover the porcini mushrooms with 4 cups of boiling water in a heat-safe container. Allow to seep 1 hour. Strain out the mushrooms, reserving the liquid. Finely chop the mushrooms, set aside. Strain the mushroom liquid through a damp-paper-towel lined strainer into a bowl (to remove any grit). Brown the sausage in a large, heavy pot breaking up any large pieces. When nearly fully cooked, drain off as much fat as possible. Add the onion, garlic and carrot. Cook until the vegetables soften then add the wine and cook until mostly evaporated. Add the cup of milk and cook until mostly evaporated. Add the tomatoes, 2 cups of mushroom liquid, salt and pepper. Stir occasionally and simmer 3-4 hours. If the sauce begins to look dry, add small amounts of the reserved mushroom liquid. Mix all ingredients listed plus the reserved mushrooms in a large bowl. Set aside until ready to use. Generously butter the bottom and sides of a 9x13 inch pan. Place a (uncooked, fresh) noodle on the bottom of the pan. Top with cheese mixture, add another noodle, top with sauce. Continue in this pattern until the pan is full, ending with a layer of space. Sprinkle with cheese. Cover in foil and bake for 30 minutes. Remove the foil and continue to bake an additional 10 minutes or until heated through. Allow to sit for a couple of minutes before slicing. Refrigerate leftovers. 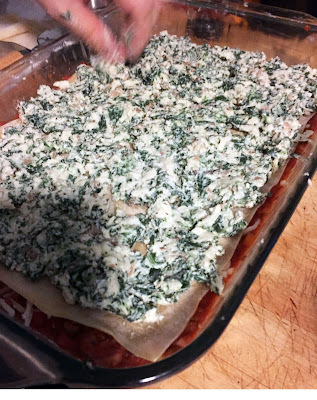 Remove leftovers from refrigerator 20 minutes prior to baking. Bake at 400 for 30 minutes, covered in foil. Remove foil and bake 10-20 additional minutes or until cooked through. *We bought these at our local Italian store where they cut them to the width of our pan (we cut the length at home using a pizza cutter). 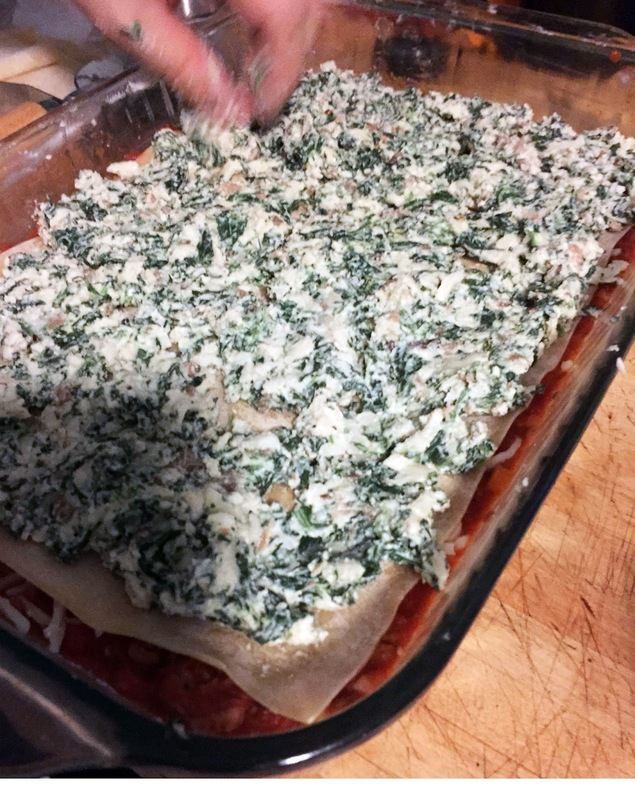 Alternately, use (cooked) dried pasta sheets or follow the instructions here to make your own fresh basil lasagna noodles. Slice any leftover fresh pasta into thinner noodles for another dish if desired. As you may have heard, Baltimore is under a ton of snow right now. As I type this now on Monday morning, the snow has been stopped since Saturday night but our street is still under nearly 30 inches of snow so we are not going anywhere anytime soon! Luckily, Matt came home early from work on Friday and stopped off at the local Italian store and brought home ingredients to make lasagna and yummy sandwiches. While he was in line, he noticed someone getting fresh lasagna noodles. It turns out they not only sell fresh lasagna noodles, they will cut them to fit your pan! We've been going there for about 10 years and never knew that. Well, that was better than the dried ones we planned on using so he picked some up too and for only about $1 more than the dried! Around lunch time on Saturday, he started the sauce and then we had the best lasagna ever for dinner! The sauce was full of sausage but surprisingly not heavy or overpowering and the filling was awesome. Lots of spinach and you could really taste the mushrooms. In fact there was so much spinach and mushrooms, I didn't even feel bad about not serving the salad I had planned. Please excuse the picture, this is actually the reheated lasagna from the next day, Saturday's lasagna was a bit prettier but it was too dark to get a good picture (it was pretty dark on Sunday too). The downside to cooking in the winter. 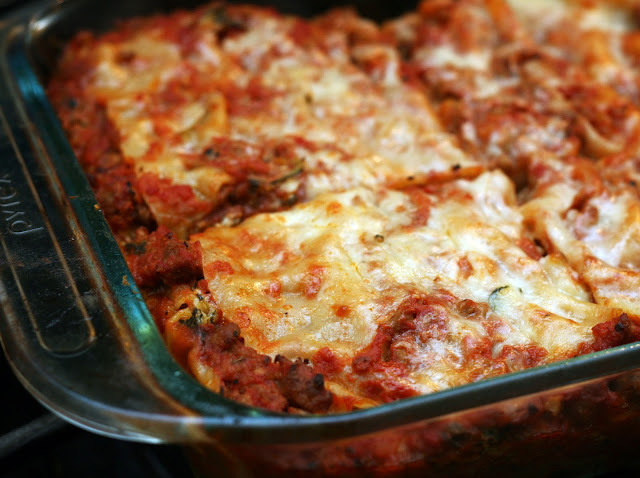 Anyway, if you find yourself snowed in or with a free day make this lasagna! You will not be disappointed.